President Muhammadu Buhari on Thursday formally received the details of the 2016 appropriation bill sent to the presidency by the national assembly on Wednesday. 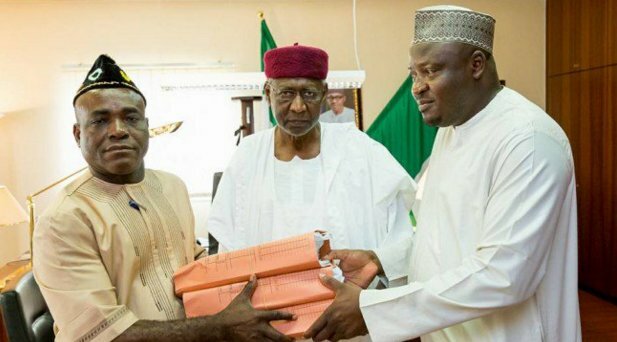 Abba Kyari, chief of staff to the president, received the over 1,800-page document from Ita Enang, senior special assistant on national assembly matters (senate), and Samaila Kawu, senior special assistant on national assembly matters (federal house of representatives). The presentation took place inside the office of the chief of staff, who signed and collected the document on behalf of the president. Kyari later led Enang and Kawu to the office of the president, where the quarter held a brief meeting. After the meeting, Enang told state house correspondents that with the transfer of the budget details to the president, “the constitutional process begins thereafter”. “We have transmitted it to the Office of the President and the constitutional process of timing starts,” he said.